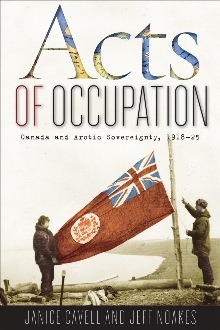 OTTAWA — An ill-timed journey during the First World War, a rocky relationship between the two leaders, the sinking of the Karluk and 11 deaths are what most historians associate with the Canadian Arctic Expedition. But, despite those drawbacks, the 1913-1918 expedition — the most comprehensive Canadian-led Arctic research project of the day — was an extraordinary success in other ways, says researcher and filmmaker David Gray, and it deserves to be recognized and celebrated. Which is why Gray and a handful of researchers and crew members — including Bob Bernard, the great-great nephew of Peter Bernard, captain of the expedition schooner Mary Sachs — are heading north again on the expedition’s 100th anniversary, to visit, map and film CAE sites which have never before been documented. Read the rest of Lisa Gregoire’s story on NunatsiaqOnline. For anyone who wants to contribute, the indiegogo fundraising page for the project – “The White North has thy Bones” – can be found here. 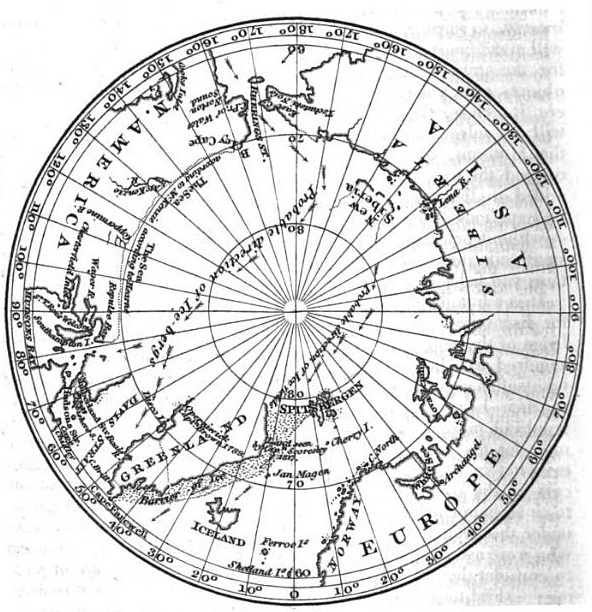 Polar map from The Quarterly Review, October 1817, page 214. Over the past decade, global warming has melted polar sea ice down to record lows—but during the same period, thanks to a growing awareness of the climate phenomenon, the Arctic and the Antarctic have vastly expanded in the popular imagination. Nowhere is that clearer than in the broad recent interest in the European, Russian, and North American explorers who crisscrossed the poles in the 19th and early 20th centuries, searching for trade routes like the Northwest Passage and the mythical Open Polar Sea. Amateur adventurers are following in the early explorers’ tracks: A six-man crew rowed 460 miles to the magnetic North Pole last year in a testosterone-fueled attempt to best Ernest Shackleton’s 1916 polar rowing record, and this summer, the New Bedford Whaling Museum sponsored a voyage to replicate the 1869 Bradford-Hayes artistic expedition up the coast of Greenland. Creative reinterpretations of the early polar narratives have been plentiful over the past decade, including this year’s Dead Men by Richard Pierce, exploring the legacy of the ill-fated Scott Antarctic expedition, and Mat Johnson’s 2011 novel Pym, a retelling of Edgar Allan Poe’s 1838 Antarctic nightmare The Narrative of Arthur Gordon Pym of Nantucket. Even the TV survivalist Bear Grylls is getting in on the act, claiming to have discovered relics of the British explorer John Franklin’s lost 1845 Arctic expedition. Read the rest of Britt Peterson’s article “Journeys to the Ends of the Earth: Scholars explore connections between polar explorations, past and present” in The Chronicle of Higher Education. Geoffrey Hattersley-Smith, from the obituary in the Globe and Mail. At first, the ice didn’t interest Geoffrey Hattersley-Smith. The young man who grew up in southeast England instead wanted to study forestry. There was much, though, that he hadn’t planned on. He left school to serve in the Royal Navy, because he felt he should, and later found himself serving during D-Day. In the end, it was another subject entirely that caught his eye, a field far removed from forestry, rural England and the war – ice. So began his trek as a glaciologist, Arctic and Antarctic academic and explorer (a term he loathed) – Hattersley-Smith became a leading pioneer of research in Canada’s Far North. He climbed Nunavut’s highest peak, endured frigid and austere conditions and delivered the Canadian government, principally its military, an unprecedented understanding of the north during the heights of the Cold War. Read the rest of the obituary on the Globe and Mail‘s website. There’s also an obituary in The Telegraph. 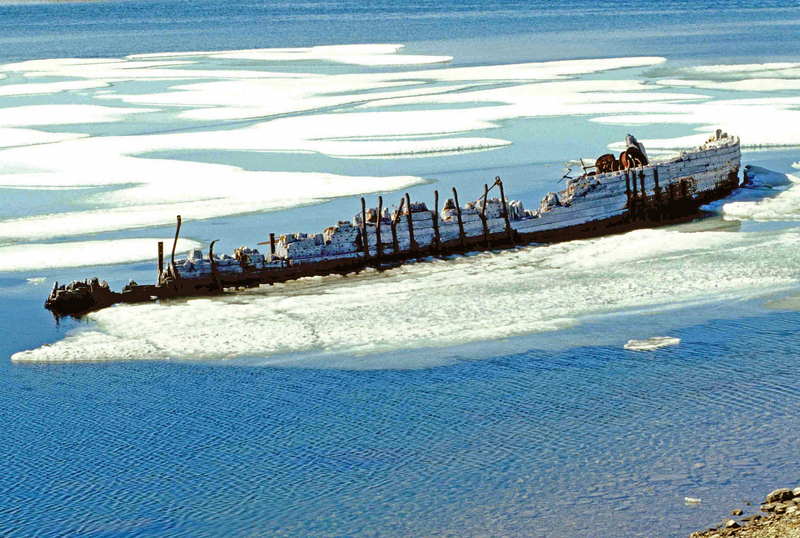 One of Hattersley-Smith’s accomplishments that garnered him attention outside of scientific circles was the recovery of explorers’ records from various cairns in the Canadian arctic. Among them were records left by the British Arctic Expedition of 1875-76, by Godfred Hansen in during his 1920 expedition to lay a depot for Roald Amundsen, and a section of Peary’s polar flag and records deposited in 1906. In one of Peary’s cairns, Hattersley-Smith also found a record left in 1930 by ill-fated German explorer H.K.E. Krüger and his companions. Hattersley-Smith discussed the discoveries he and his colleagues made in a 1955 article in Arctic, available online (pdf).